WASHINGTON (AP) — A co-winner of this year’s Nobel Peace Prize called Monday for a global fight against genocide and sexual violence, pledging to be a voice for victims around the world. “We must work together to put an end to genocide, hold accountable those who commit these crimes and achieve justice for the victims,” Murad told a packed room at the National Press Club. The 25-year-old Murad was among thousands of women and girls from the Yazidi minority who were kidnapped and enslaved in 2014 by the group that calls itself the Islamic State. The Yazidis are an ancient religious minority who trace their roots to a number of small villages in a remote part of northern Iraq. Murad was awarded the peace price Friday along with Congo’s Denis Mukwege, a gynecologist who treats women victims of sexual violence. 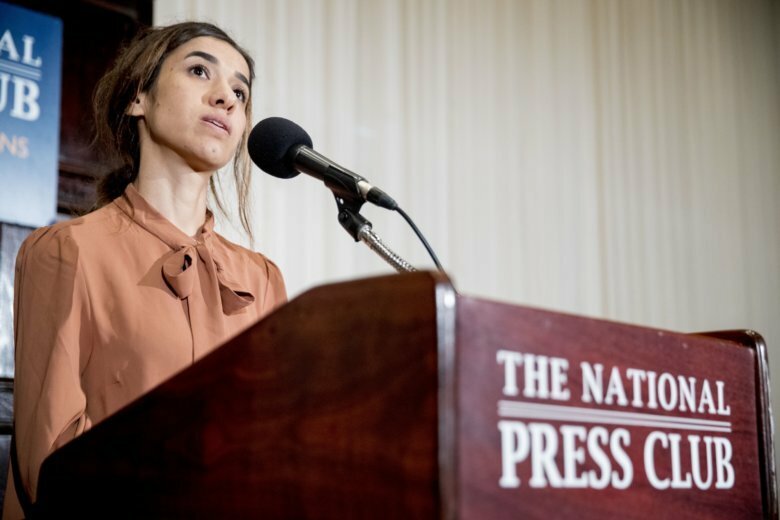 Murad said she is honored to be a Nobel recipient, but said much more needs to be done to bring the perpetrators of the crimes against her and other Yezidis to justice. “So far we have not seen justice happen for the Yazidis, especially the victims of sexual slavery,” she said, adding that said she would like to see Islamic State fighters stand trial for their crimes. In 2016, Murad was named the United Nation’s first Goodwill Ambassador for the Dignity of Survivors of Human Trafficking. A U.N. investigation into crimes committed by IS was formed in 2017 and began collecting and preserving evidence in August. Trials of IS fighters conducted by Iraqi and Syrian forces have come under criticism from human rights groups who claim the proceedings are rushed, flawed and often reliant on confessions extracted under torture. Murad also called on the Iraqi government and the international community to rebuild Yezidi towns and villages destroyed by the war against IS. With little reconstruction aid, most Yezidi territory retaken from IS in Iraq remain in ruins. The high level of destruction combined with inadequate security forces on the ground has left tens of thousands of Yezidis stuck living in camps for displaced persons years after their homes were declared liberated. Murad outlined plans to focus more on rebuilding Yezidi communities in Iraq going forward. “But without peace, even if we rebuild, life is not possible,” she added. The peace prize this year comes amid a climate of greater attention to female victims of sexual abuse worldwide highlighted by the #MeToo movement. When asked about the movement and how it relates to her experience, Murad said she hopes all survivors of sexual violence feel safe to share their stories.